Introduction - Kampar Residences Sdn. Bhd. There's no better investment for your kids than education. As the Chinese proverb goes, "Teach a man to fish, he will be filled for a lifetime". Seven schools lie within the township. Inspire your kids by visiting the Kolej Tunku Abdul Rahman and University Tunku Abdul Rahman - situated on the North - awaits their talented mind. Prepare your children for the future; let Kampar Residences be the nest for it. 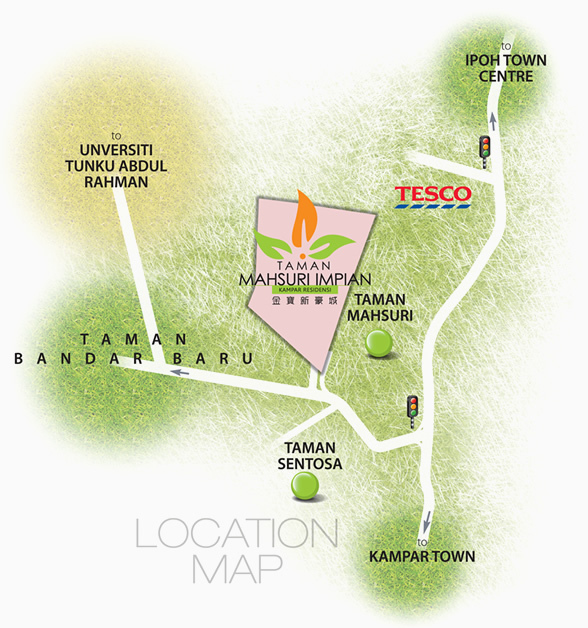 Taman Mahsuri Impian is strategically located in the entrance to the new Kampar Township. With less than 5 minutes drive from UTAR, TARC, and nearby amenities, it is the perfect residential location for students.